David Lance Johnston was born in 1962 and entered the Royal Australian Naval College as a junior entry Cadet Midshipman in 1978. He graduated from the RAN College in 1982 as a seaman officer, later specialising as a Principal Warfare Officer. He has served as the Commanding Officer of HMAS Adelaide (FFG 01) and HMAS Newcastle (FFG 06). The latter command included deployment on Operation QUICKSTEP to Fiji in 2006. His staff appointments include Command and Control specialist staff positions in Australian Defence Headquarters, Operations Manager at Sailors' Career Management and later as Director Joint Plans in Strategic Operations Division, where he developed the military response options for consideration by Government. In July 2007 on promotion to commodore he joined Fleet Headquarters as Commodore Flotillas where he was responsible for planning maritime operations and the operational training and preparedness of Navy's ships, submarines and diving teams. In 2008 he performed the duties of Deputy Coalition Force Maritime Component Commander role and Australian National Commander for Exercise RIMPAC 08. In November 2008 Commodore Johnston assumed the role of J3 (Director General Operations) at Headquarters Joint Operations Command. This role encompassed the operational level execution of all Australian Defence Force operations both overseas and within Australia. Commodore Johnston deployed to Operation SLIPPER, in the Middle East Area of Operations, in October 2010 as the Deputy Commander Joint Task Force 633. He supported the Commander JTF 633 in providing national command oversight of all Australian Defence Force elements conducting maritime, land and air operations in Iraq and Afghanistan. He was promoted to Rear Admiral in March 2011 to undertake the role of Deputy Commander of the Combined Australian/US Task Force for Exercise TALISMAN SABRE and later assumed the role of Deputy Chief Joint Operations Command on 6 June 2011. During his tenure he commanded Defence operations that supported the Commonwealth Heads of Government Meeting 2011 and the visit by the President of the United States of America later in that year. He was made a Member of the Order of Australia (AM) in the Australia Day Honours List for 2012 'For exceptional service to the Royal Australian Navy in senior Naval and Joint operational staff appointments'. Additionally on the same honours list he was awarded a Commendation for Distinguished Service 'For distinguished performance of duty in warlike operations as Deputy Commander Joint Task Force 633 on Operations SLIPPER and KRUGER from October 2010 to March 2011'. Rear Admiral Johnston was appointed Commander Border Protection Command in December 2011. As commander of the whole of government multi-agency organisation he was responsible for the security of Australia's maritime domain utilising resources from both the Australian Defence Force and the Australian Customs and Border Protection Service. Following promotion to Vice Admiral in April 2014 David Johnston assumed the appointment of Chief of Joint Operations in May 2014. His current role is to plan, control and conduct military campaigns, operations, joint exercises and other activities in order to meet Australia's national objectives. In the Australia Day honours list 2018 he was made an Officer of the Order of Australia (AO) 'For distinguished service to the Australian Defence Force in senior command and staff appointments'. 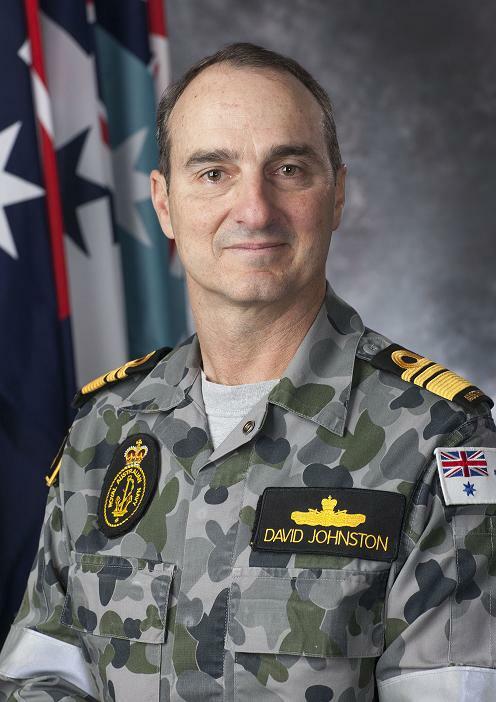 Vice Admiral Johnston holds a Master of Science in Operations Research from the USN Postgraduate School in Monterey, California and a Master of Arts in Strategic Studies from the Australian Defence College, Weston Creek. He participated in the inaugural Australian Security Executive Development Program in 2009. In July 2018 Vice Admiral Johnston was appointed as Vice Chief of the Australian Defence Force.